Yes, this week is filled with LUCK, leprechauns, and all things St. Patrick’s Day! That’s where my Grandfather Thomas Amadon O’Brien comes into this post. Yes, this name is and sounds VERY IRISH and it is. I love that I have a little bit of green in my ethnicity. But this post is about so much more than my Irish background. This post is about my love and Ethne’s love for Grandparents. The timing of this post is fitting because Ethne had a major loss this past week, her Grandma H passed away. And it made me think of my Grandparents and the fond memories I am lucky to have, the lessons that were learned, and the loss I feel each and every day because they are no longer here. To anyone who was lucky to know their grandparents or still has their grandparents, please cherish them each and every day. They are unbelievable people. First up is Steve’s Grandma (Grandma Liz). Grandma Liz had a spit-fire personality, and I was lucky to know her the last few years of her life. All Grandma Liz talked about was dying—Steve said that this began years ago when her husband passed away. She yearned to be with him. There are so many stories of Grandma Liz, her blunt personality, and her wish to no longer be here. In the end the things she would come up with were hilarious! Grandma Liz had a doctor’s appointment and Steve’s mom called to update us on it. Steve's mom said, “the appointment went good.” In a faint voice in the background Grandma Liz called out, “too good”. Or, I will never forget the video cam at Christmas story. Steve and I asked everyone to record their wish for the following year. Most people said good health, peace on earth, and so on. However, all Grandma Liz wanted was to “not be here next Christmas.” Grandma Liz got her wish and she is no longer here. Thank you, Grandma Liz, for the fond memories. 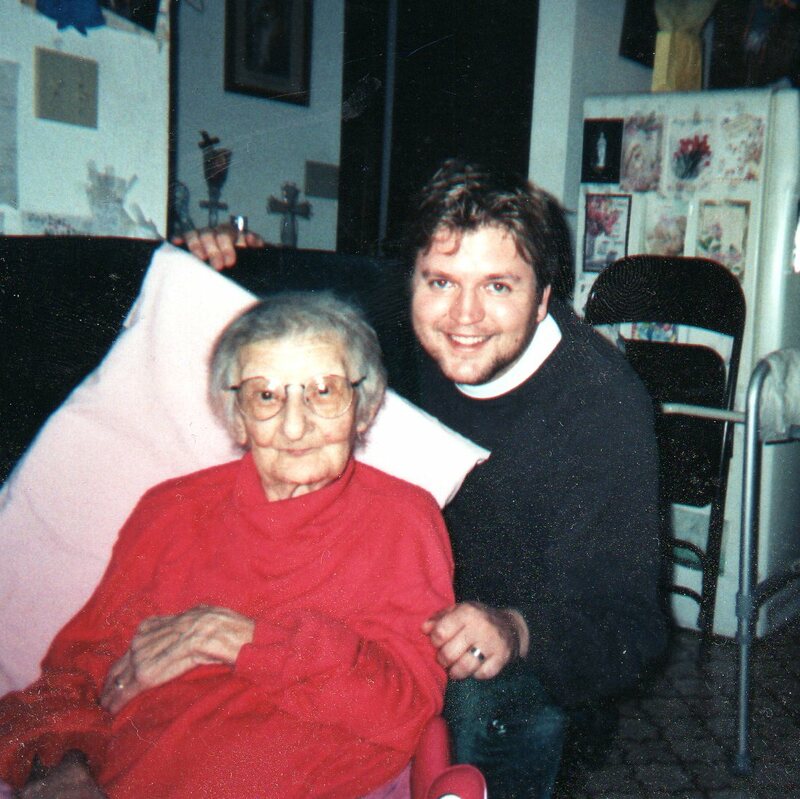 The most loss that I have ever felt up until this point is the loss of my Grandmother Melba O’Brien. Grandmother died after a long and hard battle with terrible, horrible Cancer. She was in so much pain. I tear up thinking about it. 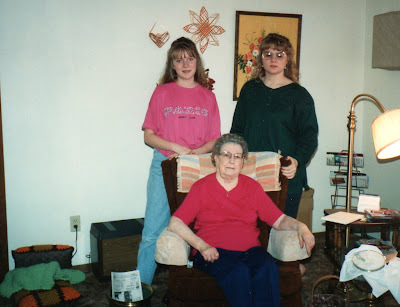 With my sister and our Grandma O'Brien. This photo must be from the early 90's. 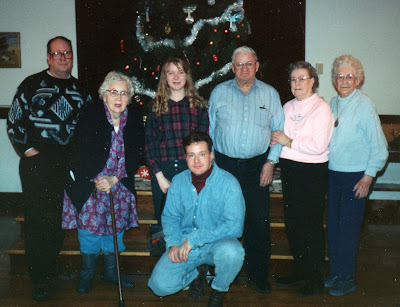 Then there is my dad’s mom Grandma Dagny Gudmunsen. Dagny was 100% Norwegian, spoke fluent Norwegian, and went to Norway frequently. Dagny was a strong Norwegian who started out as a teacher in a one-room-school house on the prairie. 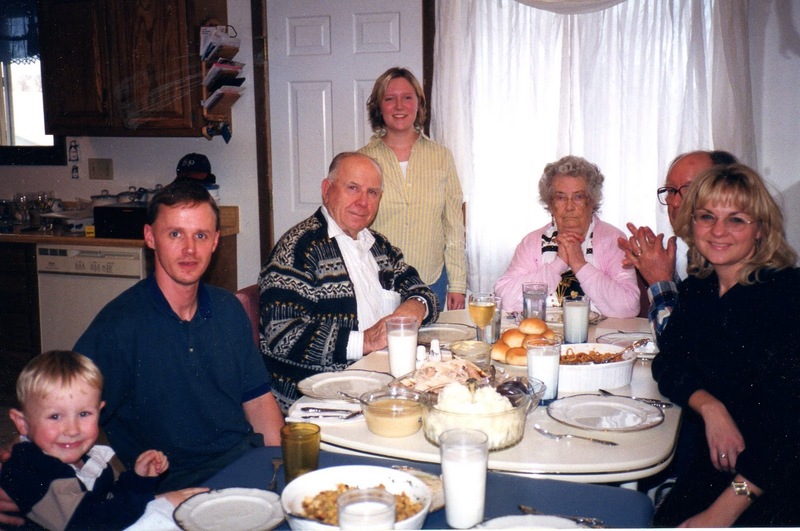 She was an awesome cook and her specialties included pie, lefse, and homemade donuts. Grandma Dagny is no longer with us, but I do have plans to name my first daughter Dagny someday. Grandma Dagny sitting prominently at the end of the table. I know there are tons of grandparent stories to share and unfortunately, I wasn’t fortunate to know all of my grandparents or to meet all of Steve’s grandparents. But what I do know more than anything is to LOVE them with all your heart. Grandparents are special people. This is a very special article for me to read today as I just lost my great aunt, 100 years young, today. To me, she's always been one of my grandparents and had a huge influence on who I am. My father's mother was also 100% Norwegian and started out teaching in a one room school house in Western ND! Hey Lori, touching post! I lost both of my grandmas over the last 2 years. I was really really close to one and being with her as she dealt with colon cancer was heartbreaking but I am so proud to be her granddaughter and have all the wonderful memories from my childhood with grandma and grandpa w. I can't wait for Maddy to be old enough to remember the good times she has with her grandparents!! Hello Tara and Anonymous: Thank you for the comments. Grandparents are the best! I am so glad that we have those memories! And I am so sorry for your losses! I am looking forward to Mur-Man having those memories too!